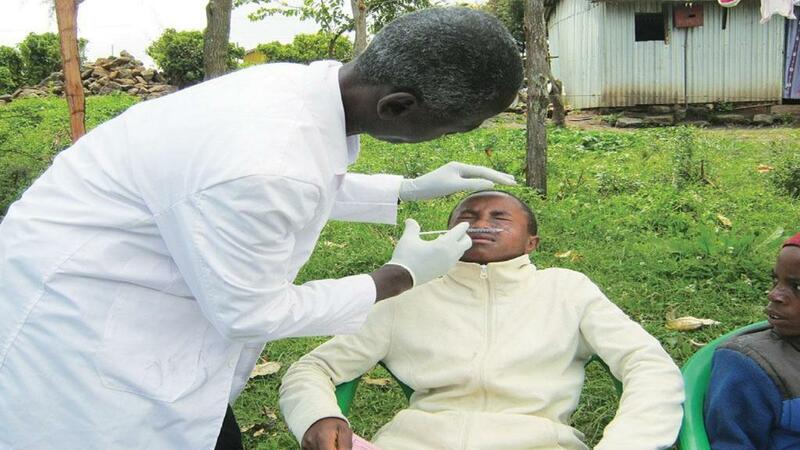 Around 20 people have gathered at a grassy patch in front of a tin shed in Gitare village in Nakuru County, Kenya, to get treatment for cutaneous leishmaniasis (CL), a disease caused by a protozoa called Leishmania which passes from the rodent reservoir hyrax (Procavia capensis) to humans through sandflies. David Kamare, coordinator for disease surveillance for neglected tropical diseases (NTDs) at Gilgil and part of the team of clinicians, begins the treatment on 14-year-old John Nderitu. “If I start with the little children, there would be so much crying that it would be impossible for me to treat all the patients,” he says. The disease manifests as scars on the skin. The reason for the children crying is clear once the treatment process begins. It entails injecting sodium stibogluconate (SSG)—for a scar with a diameter of 3 cm, the syringe needle is injected around 10 times under the scar. The process is painful and blood flows out profusely. The young boy braves it only with his grit as anesthesia is not available. Nderitu is lucky that his illness was diagnosed early. He got the lesions in August 2017, but his treatment began in March 2018 after his school friends identified the disease. Others end up without treatment for years. CL is a zoonotic disease. Young boys are more likely to catch the infection as they play near the rocky caves and go hunting in the forests. The rodent, hyrax, is found in the rocky region and the boys kill it for food. As they carry the animal home, sandflies that live on the animal, transmit the pathogen from the rodent to the children. The area has witnessed massive deforestation, which too could have increased the contact between hyrax and people. “The animals form a part of our diet, but the government should spray insecticides in the area to kill the sandflies. But this rarely happens,” says Leah Nyambura, chief of Gitare. The team has identified 152 cases in Gitare alone since June 2016. The health centre does not have enough medicines to treat the patients. They collect money among them-selves to buy the syringes. “We have found that cryotherapy along with SSG is useful to treat CL, but we do not have any provision to administer this to patients,” says Kamare. They would need sterile cold packs for this but these are not available. The disease doesn’t get government attention and the country does not even have guidelines or a treatment protocol. However, the country has guidelines for a related disease, visceral leishmaniasis (VL), which is also spread by sandflies. 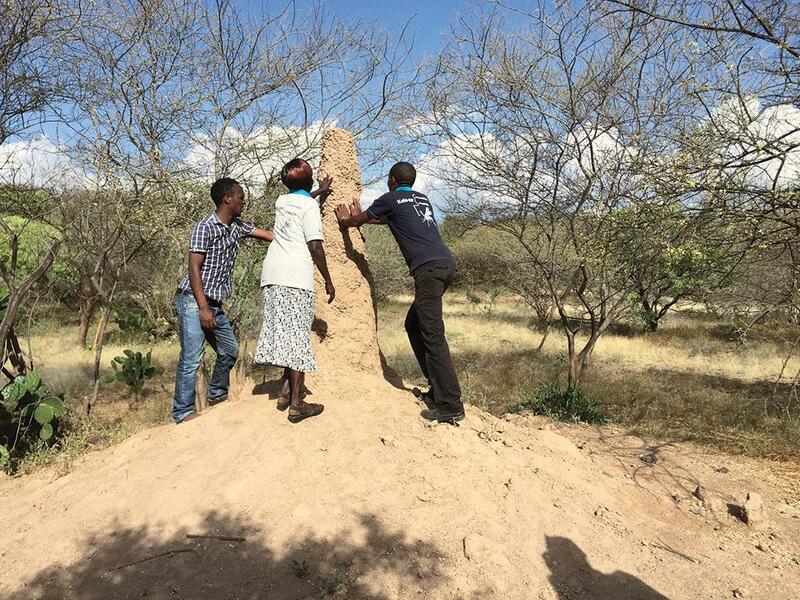 Here, the sandflies takeover the old termite hills and when children play around them, they contract the disease. This disease is common in Baringo County. “It is difficult to control the disease in places like Baringo as people migrate extensively and sleep in the open,” says Samuel Chirchir, who used to work with the Kenya Medical Research Institute (KEMRI) in the 1980s. “Awareness is important. That’s why we have involved Kaperur, a community-based organisation, in the programme. The members refer patients to the health facility,” says Elijah Plilan, public health officer at Chemolingot in Baringo. “We tell nomadic population to carry their mosquito nets with them, check the area for sandflies, destroy old termite hills and build safe houses,” he says. This does not always help. Josephat Kiptui, who recently purchased a house in Baringo, knew about the dangers of termite hills and was actively destroying them, but this did not help protect his seven-year-old daughter, Brigid, from contracting the disease in May. Diagnosis was difficult. First she was treated for malaria, then tested for HIV, and it was only when the clinicians suggested that she be treated for pneumonia that Kiptui put his foot down and brought her to the only treatment centre in Baringo, the Kimalel Health Centre (KHC) in August. Around 90 per cent of patients who are treated here are from East Pokot. More would have come, but the Pokot tribe does not get along with the Tugen tribe that lives around KHC and patients are averse to come there unless there is an emergency. “We are trying to improve the clinical infrastructure at East Pokot,” says Richard Wamai, professor of Global Public Health at North-eastern University in Boston Massachusetts, USA. He and his team have got funds from Probitas Foundation in Spain and Izumi Foundation in Japan to renovate the Chemolingot sub-county hospital and equip the laboratory.” We want the centre to have facilities for spleen aspiration which is the gold standard for identifying VL patients”, he says. This would ensure that there is timely diagnosis and treatment of VL in the areas and help patients by reducing the cost of hospitalisation. “Most residents of East Pokot have the odds stacked against them. The sub-county is sparsely populated and highly marginalised. They are housed far away from administrative centres and government health personnel hardly visit this area,” says Hellen Nyakundi, a public health specialist managing the Kala Azar project in East Pokot along with Wamai. “There is little focus on either CL or VL as the burden is not as high as diseases like malaria and HIV,” says Damaris Matoke, senior research officer at KEMRI. “There are no special provisions to control the sandflies and people get protected indirectly through the malaria programme under which treated bed nets and residual spraying is provided,” says Matoke. Along with CL and VL, a total of 20 diseases have been classified as NTDs, and estimates show that 40 per cent of the global disease burden of these has been reported from Africa. The World Health Organization’s (WHO) regional director for Africa, Matshidiso Moeti, says if Sub-Saharan Africa eliminates NTDs by 2020, it could save almost US $52 billion in productivity over the next decade (see ‘Shifting the focus’,). In Uganda, another neglected disease, schistosomiasis or bilharzia, is wreaking ha-voc. The disease is caused by a parasitic worm which spends a part of its lifecycle in snails present in the lakes and waterbodies. People exposed to this water or the fish that grows in it contract the disease and, in turn, shed the parasitic eggs in their faeces and urine. This then makes its way back into the lake, and the cycle starts again. “Bilharzia is human-made disease resulting from humans failing to observe hygiene in their surroundings,” says Moses Adriko, programme officer in charge of controlling Bilharzia at Uganda’s Ministry of Heath. The disease in endemic in 82 of Uganda’s 127 districts and affects 17 million people living around waterbodies and rice fields. A survey carried out under the Performance Monitoring and Accountability 2020 (PMA) by the Ministry of Health and Makerere School of Public Health and concluded in June 2018, that schistosomiasis affects three in 10 people in Uganda, with children between the age of 2 and 4 at the highest risk. The disease can have a negative economic impact on households, particularly the poor, who do not have adequate resources to seek treatment. “Schistosomiasis is an urgent public health problem in Uganda,” explains Fredrick Makumbi, PMA 2020’s Uganda’s principal investigator. “We must work together across the health, water and sanitation sectors to develop comprehensive solutions to combat the disease throughout the country.” So far, the ministry of health provides medication to 44 districts where it is administered every year in schools and surrounding communities. The remaining districts get medication after every two years because the problem is not acute there. The drug, Praziquantel, is provided by WHO. Development organisations such as Beijing-based Sinoc Investment company, Ministry of Health and UNICEF, Save the Children Fund are also trying to sensitise the communities to keep the environment around the lakes clean. Simon Kaddu, district health officer, says this intervention can help to eradicate other diseases like cholera too. Adriko explains that there is a possibility of eliminating the disease by 2030 because of the steps undertaken by the ministry to generate awareness. When it comes to NTDs good news such as the elimination of lymphatic filariasis in Togo, trachoma in Ghana and Guinea worm disease in Kenya are rare. The London Declaration—signed by countries endemic to NTDs and other stakeholders in January 2012—pledged to control or eliminate 10 NTDs by 2020 and then the Expanded Special Project for Elimination of Neglected Tropical Diseases (ESPEN) too planned to eliminate NTDs in Africa by 2020. These neglected diseases have been given traction in the Sustainable Development Goal 3 (SDG), which has set the target for elimination by 2030, which would mean a 90 per cent reduction in the number of people contracting NTDs by 2030. NTDs have been termed as the litmus test for attaining Universal Health Coverage (UHC). However, the link is not direct. The index to monitor progress in UHC has been developed, but this does not include progress in control of NTDs. Recently, researchers from WHO offices in Geneva and Congo developed an index which can be compared with the UHC index to see if the countries which are likely to meet the UHC target are doing well in the NTD sector too. The results show that progress in UHC does not mean that the country is doing enough to control NTDs. For example, in 2015, South Africa did not provide preventive chemotherapy for schistosomiasis and soil-transmitted helminthiases, but the UHC service coverage index suggested that South Africa is the best performing country in the African Region. There are countries like Ghana, Malawi, Sierra Leone and Senegal where the NTD index exceeds the UHC index and researchers posit that it is possible that medicines and treatment are being provided independently by other health agencies . It would be good if these systems are looked at to deliver other essential services to the poor, says a study published in The Lancet Global Health on September 1, 2018. “Achieving the SDGs simply can’t be done without eliminating NTDs,” adds Moeti. However, there is hope both for Kenya and Uganda in the future. “There is high level commitment to eliminate these diseases and we have a well-coordinated plan to ensure that all poor people get the treatment,” says Sultani Matendechero, manager of the National Neglected Tropical Diseases Program in Kenya. “We should not call them neglected tropical diseases. We do not want to neglect them anymore,” adds Matendechero. (This article was first published in the 1-15th December issue of Down To Earth under the headline 'Still neglected'. It is part of a series on healthcare in Africa).